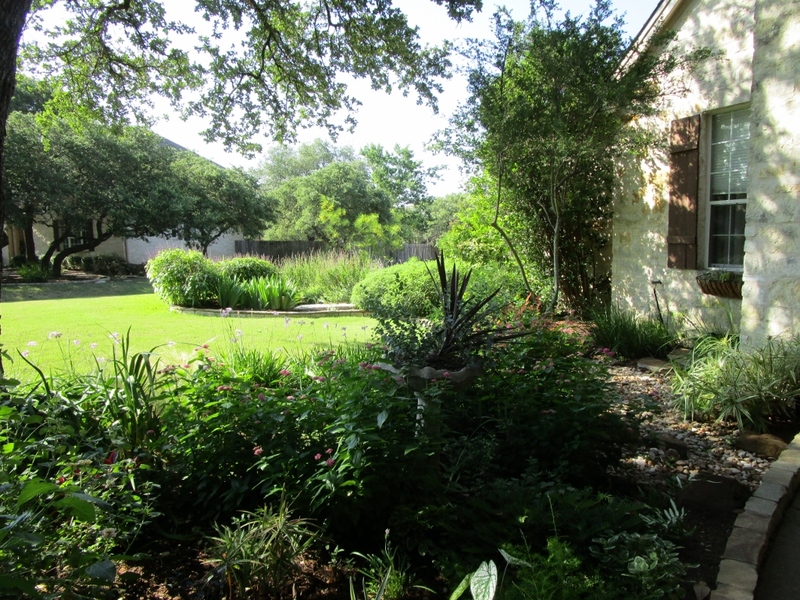 In early May I joined over 90 garden bloggers for the 10th Annual Garden Blogger's Fling in Austin. 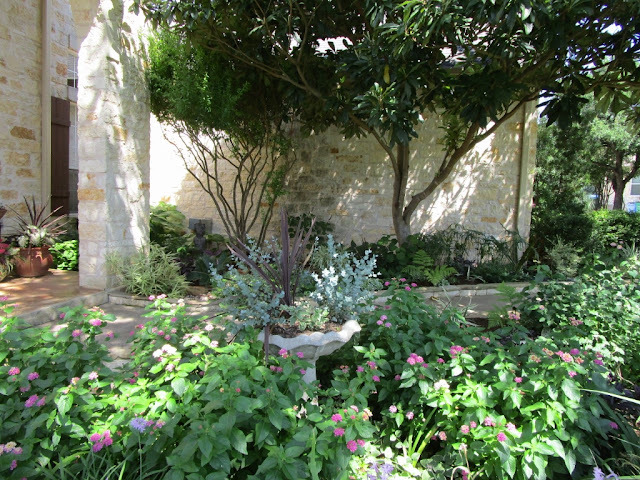 We spent three days touring spectacular gardens in the Austin area. On Day 1 we were excited to head over to Fling planner and blogger Diana Kirby's garden after our tour of The Lady Bird Johnson Wildflower Center. Unfortunately we arrived for our tour of Diana's garden in the midst of a pouring rain! Fling planners provided plastic ponchos for us so at least we could make a run for the pool gazebo. Noelle the Arizona Plant Lady in blue and Victoria Summerly of Tales From Awkward Hill in the green. Diana had worked hard to get her garden ready and we were determined to see it even in the rain. Smiles show we made the best of it but good photos were difficult to say the least. When we tired of the rain our group huddled in the kitchen and enjoyed fresh fruit and snacks Diana set out. Kitchen tour is nice but a garden tour was our goal! We all knew how it must have felt to see two years of prep work and anticipation come down to this. For the rest of the weekend I spoke with other bloggers who expressed their disappointment so I asked Diana for a rain check since I am just an hour away. The first time I mentioned the possibility during the Fling she offered to have me a stop by on the way home. While she lives (more or less) on my way home from downtown Austin I knew that when our buses arrived back at the hotel around 8:30pm on Sunday I'd be way too tired to do it justice. As it turned out, Diana, as one of the three main planners, seemed pretty tired by Sunday night also. I emailed her a few days later, we set a time and I rounded up a couple of garden-loving friends who enjoy road trips. Meanwhile the Central Texas Gardener crew was there to video Diana's garden for a future show so you'll all get to see it again too. We arrived just after 9am on a gorgeous sunny day to enjoy these sweeping curved beds drawing our eye to Diana's beautiful home. 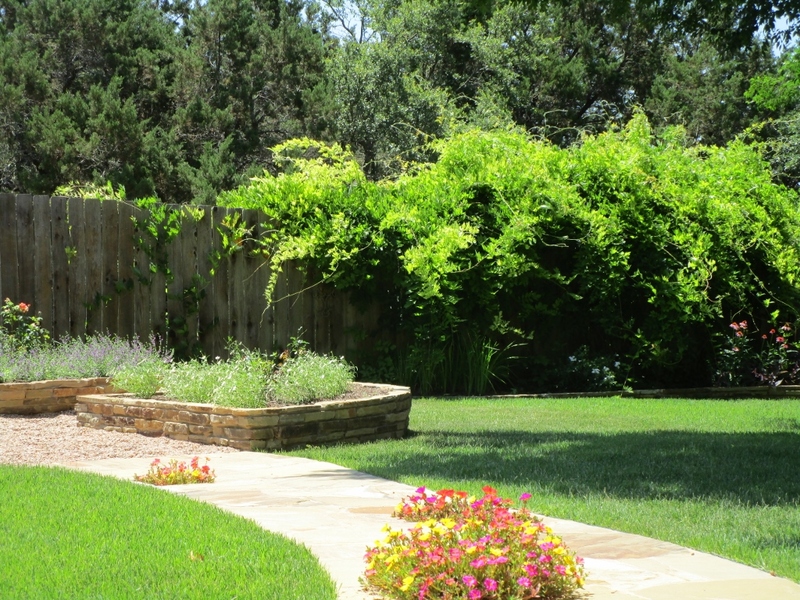 No surprise since Diana is a garden designer at Diana's Designs Austin. 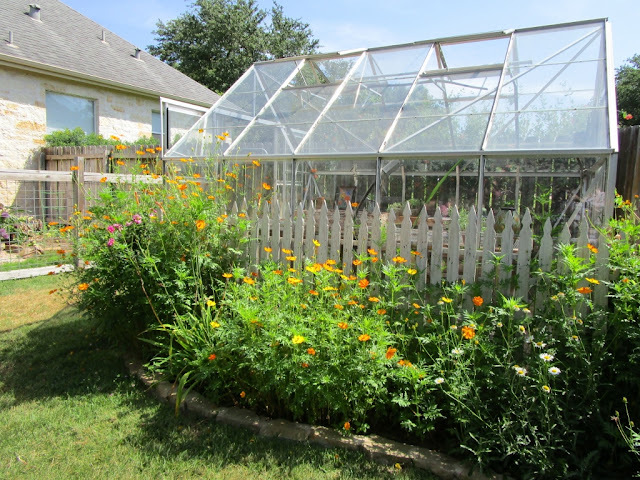 In addition to designing gardens for clients she blogs at Sharing Nature's Garden and writes the garden column for the Austin American-Statesman. 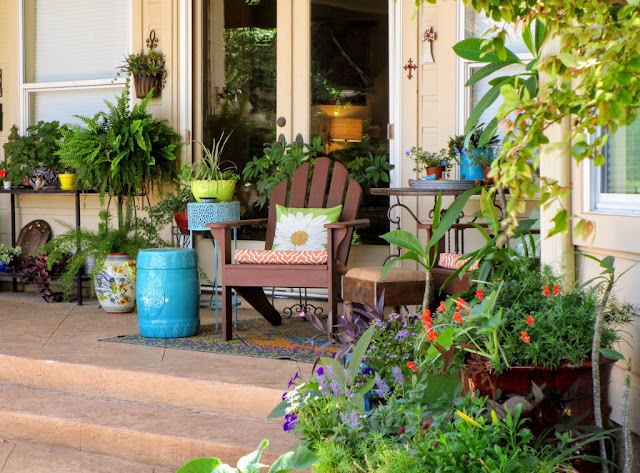 Without the pouring rain we didn't have to make a mad dash to the front door, and could take our time enjoying colorful beds on both sides of the front walk. 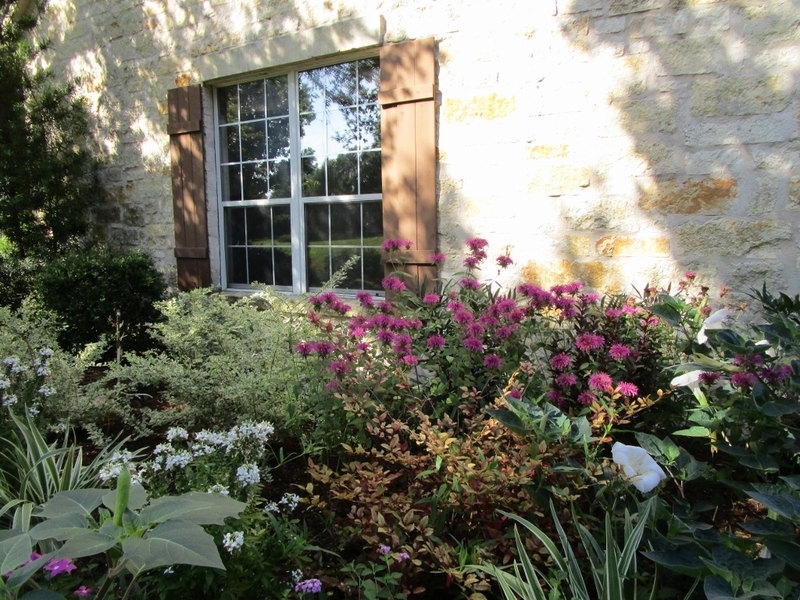 This mix of great foliage and bright Mondarda blooms was a preview of Diana's skill at plant placement throughout her gardens. 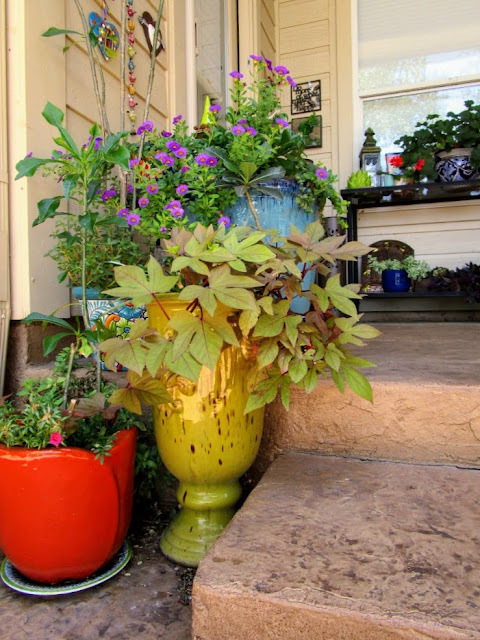 We enjoyed our walk so much it took us several minutes to reach the door and this welcoming container arrangement. It looks so casual yet clearly a good bit of thought and talent are on display. I made special note of how Diana works bright Talavera pottery into displays throughout her garden since I am adding more Talavera to my own container arrangements. What a difference on a sunny day! Shady beds near the front display foliage and textures in contrast with bright tropical flowers elsewhere in the garden. I'm a huge fan of Sparkler Sedge (Carex phyllocephala 'Sparkler') for brightening shade. I even stopped by Barton Spring Nursery, a fling sponsor, on our way home just to purchase three of these. 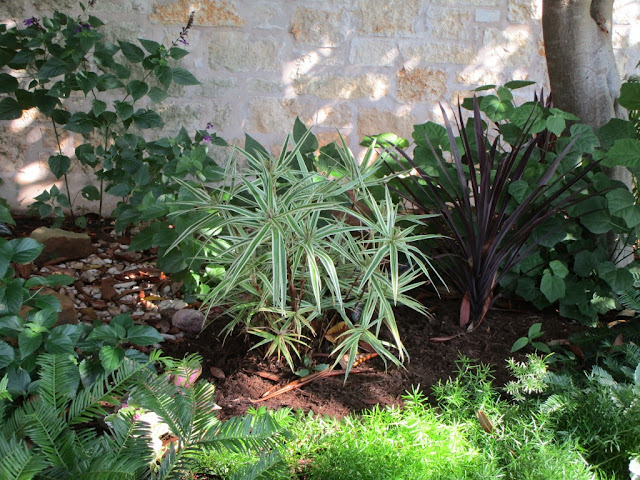 Deep purple cordyline might seem counterintuitive for shade but here it serves to add contrasting color and repeat the spiky texture of the sedge. Oh so pretty and lush despite an unusually hot summer so far. Back to that muddy, rainy day when I stuck to the porch carefully avoiding standing water. Several years ago Diana added low stone edging along the walk to keep mulch from washing over. Seeing this on a rainy day certainly highlights how well the idea functions and the importance of taking drainage issues into account when designing your garden. 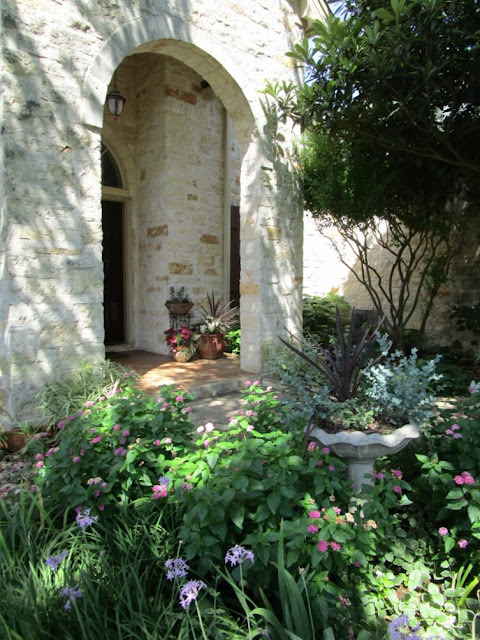 This photo, which would have been a challenge in the rain, shows beautiful flowers and foliage near her front door. 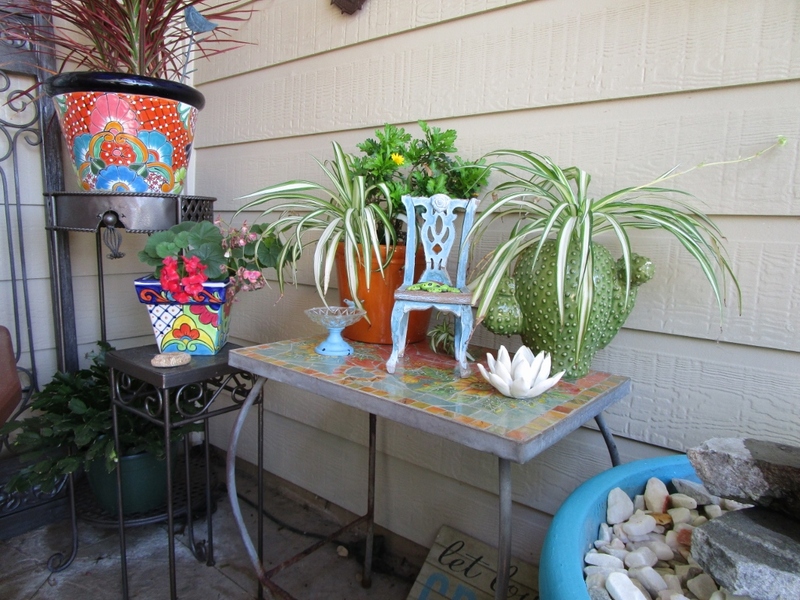 Diana's container plantings continue to inspire as even the birdbath has been planted up beautifully. 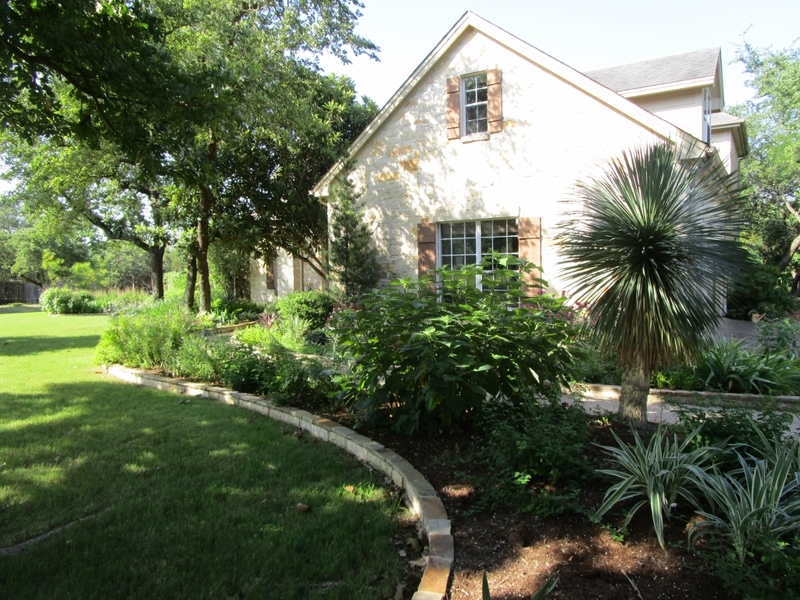 The side garden at the end of the driveway is an area I didn't explore in the rain. Blue ceramic fish are from the Arbor Gate shop near Houston and I even remember when both Diana and Pam Penick wrote about their visit there. 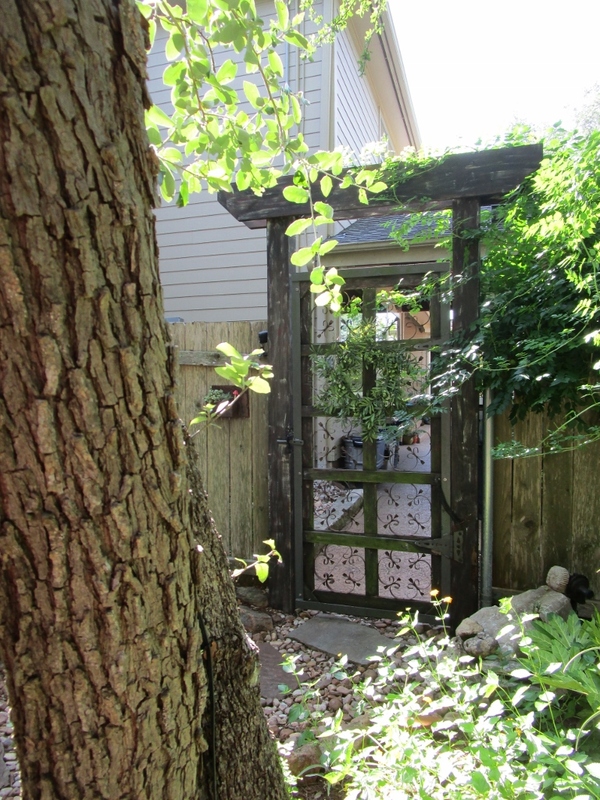 After exploring the woodland shade garden we headed through the pretty side gate into the back yard. 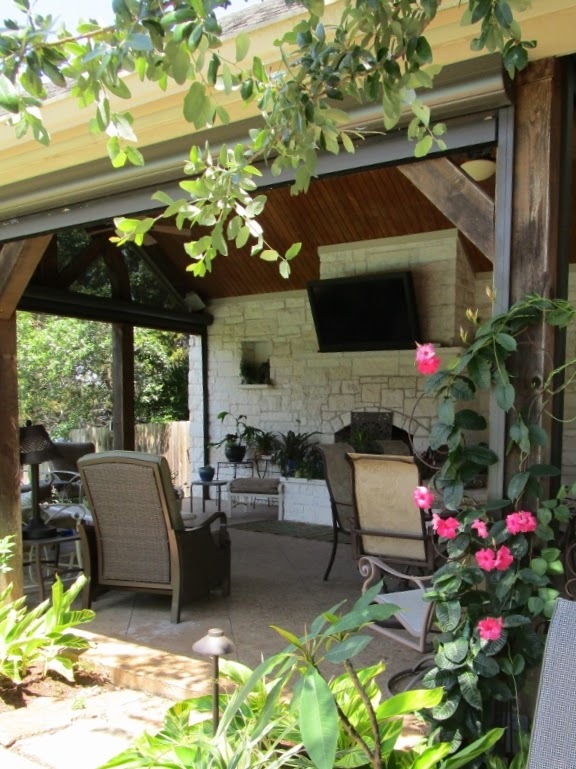 Just inside the gate a custom air conditioner surround Diana designed is a brilliant way to distract the eye from utilities visible from the breakfast table. Over to the nearby gazebo complete with stone fireplace which Diana told us sold them on the house about 14 years ago. 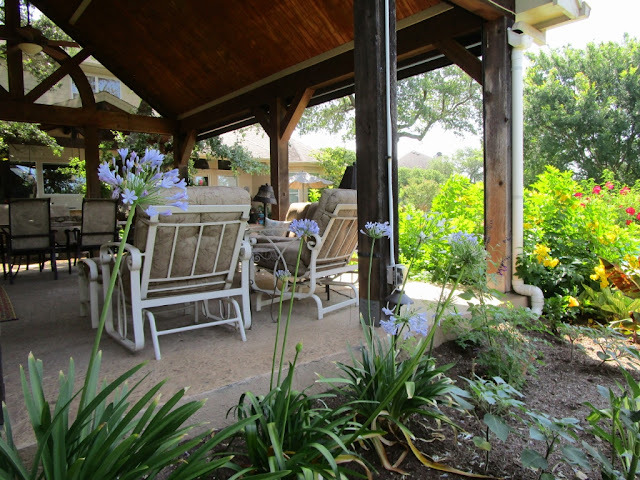 Colorful flowers replace ponchos this time and reveal a beautiful place to relax in a tropical setting. 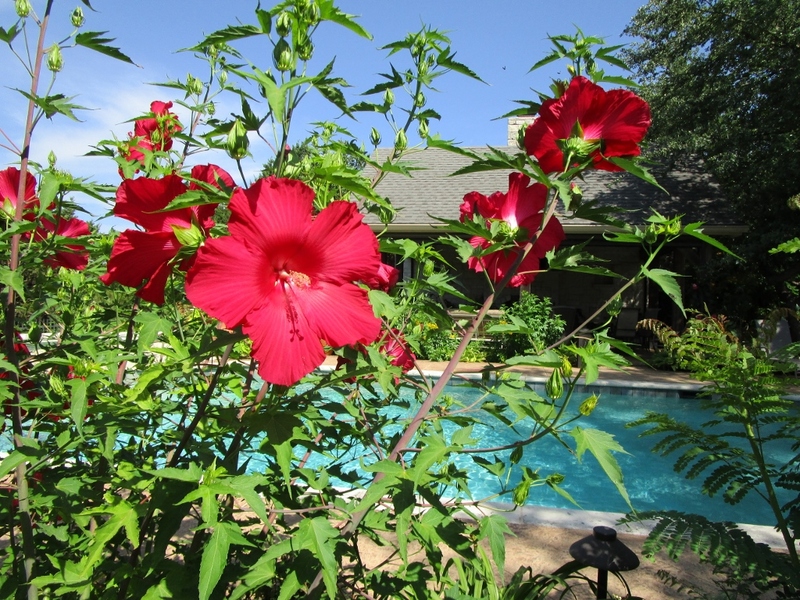 Across the pool Lord Baltimore Hibiscus is quite hardy despite its tropical look. 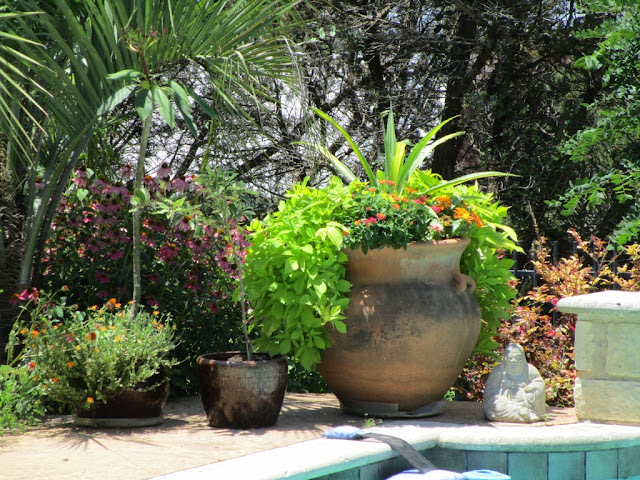 I was so impressed with how Diana achieved so much tropical style around her pool since Austin can get quite cold during winter. 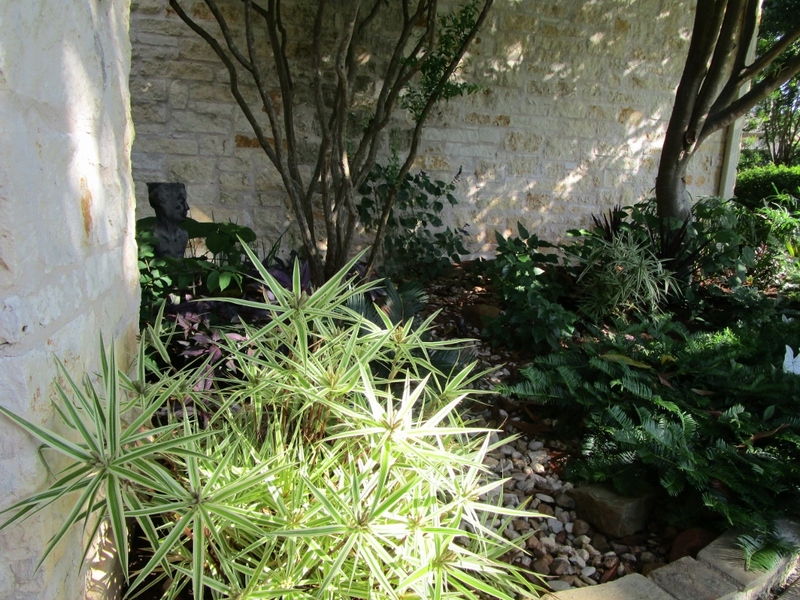 She told us her microclimate is a bit warmer than most of Austin and the envy of her gardening friends. 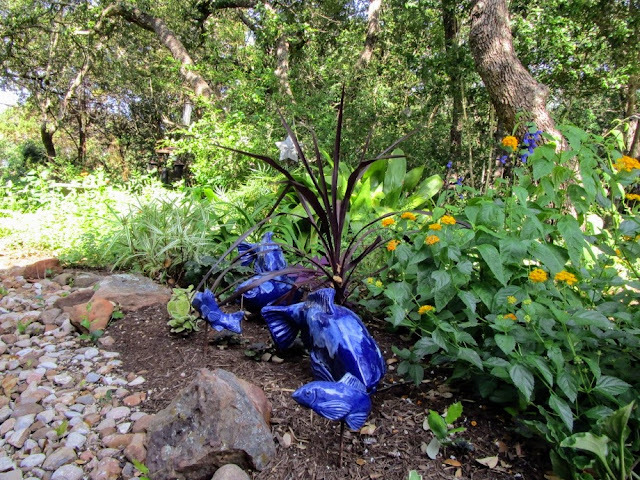 In fact I noticed she can grow plants that will freeze in San Antonio. We all wanted a seating space like this at our own homes. I didn't try the chair with its view over the pool to a green space beyond the fence because I might still be sitting there! More great containers in that view! Back on the porch a pretty collection by the backdoor coordinates without matching. 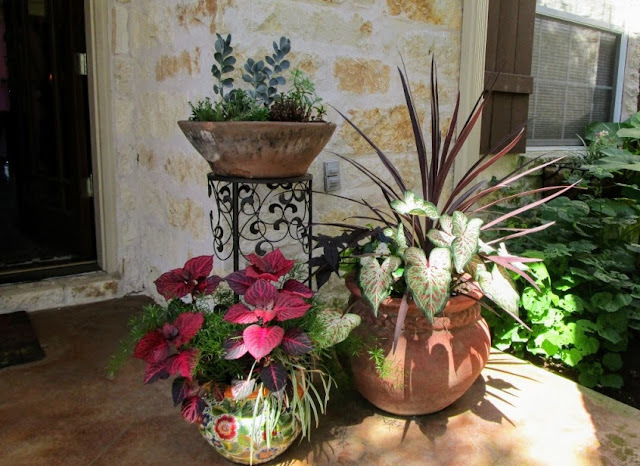 More of those bright containers full of blooms and foliage! I especially liked the footed urn shape of that yellow-green pot and have been on the lookout for a similar one. Just a few of the great details and vignettes found throughout the garden. The birdhouse is another Arbor Gate find. 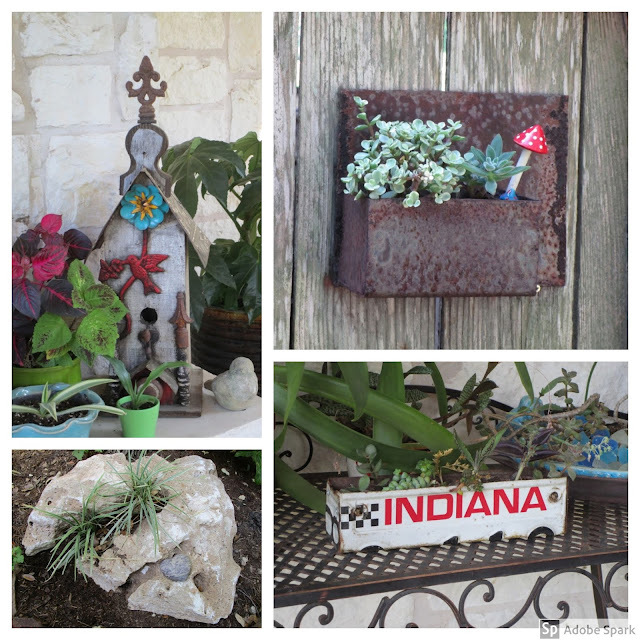 The Indiana license plate planter is a nod to her husband's home state. Our next destination is the new parterre against the fence. 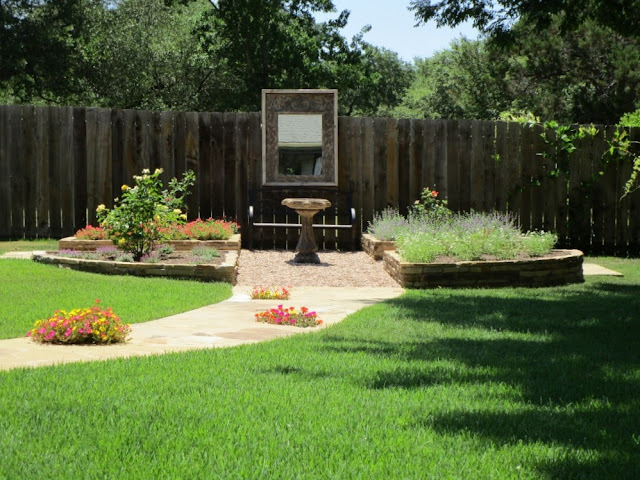 Each quadrant features a different rose with colorful perennials at its feet. Planting spaces left open in the new stone walkway are filled with colorful and charming portulaca. I loved this idea. Contrast that with our Fling day visit. Cosmos against the nearby greenhouse coordinate with the hot colors of portulaca in the walkways. The corner becomes a place to pause with a gorgeous combination delicately woven together by (what I think is) Clematis pitcheri or Purple Leatherflower. 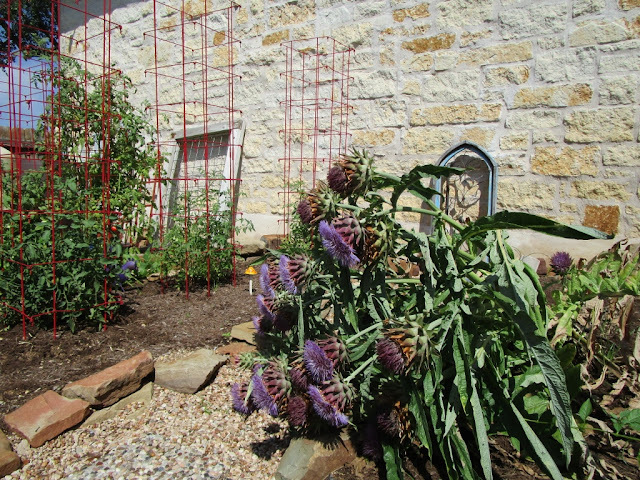 We toured the veggie garden nearby. I'd be happy with just one artichoke bloom and here they've fallen over from the weight of so many! We were treated to fresh tomatoes at lunch. Yum! 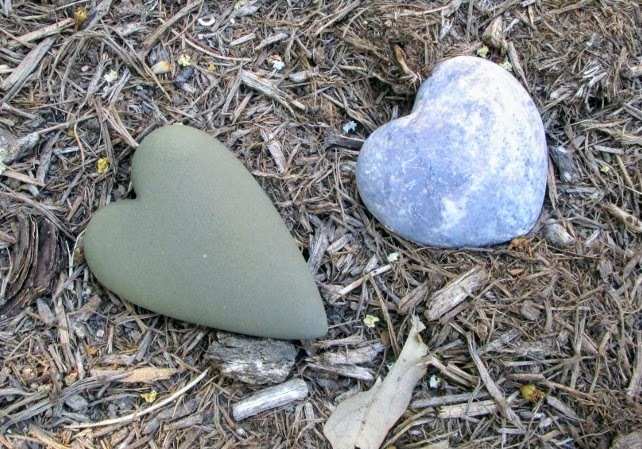 When Diana visited my garden several years ago she expressed surprise that I lived in a neighborhood and not in the country. In a slight turnabout I had pictured Diana's house as being closer to the city. 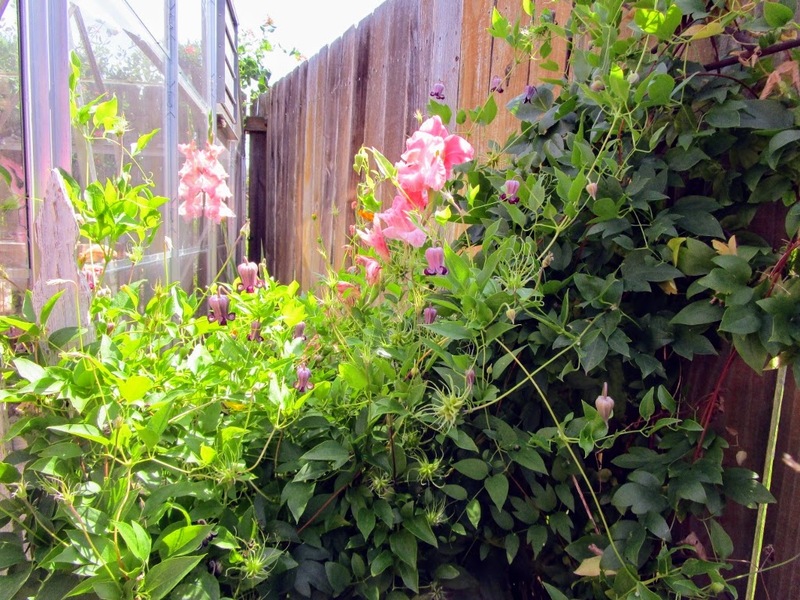 Her garden is quite a bit larger and farther out of town than I pictured from her blog. She's made it even larger by planting the greenbelt behind her fence. 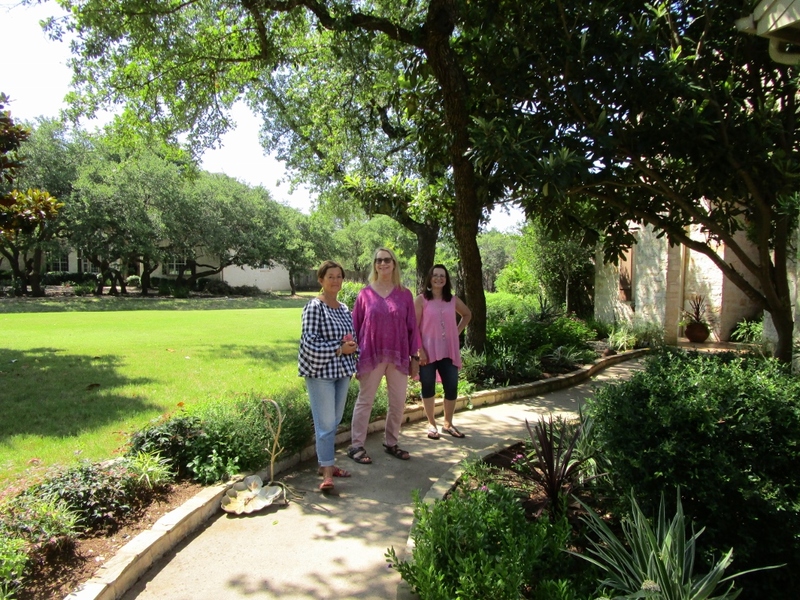 Friends from San Antonio, Lorraine and April, join Diana (right) in a group photo during our tour. All too soon after a delicious lunch and fun conversation it was time to leave. Heading back out the driveway. 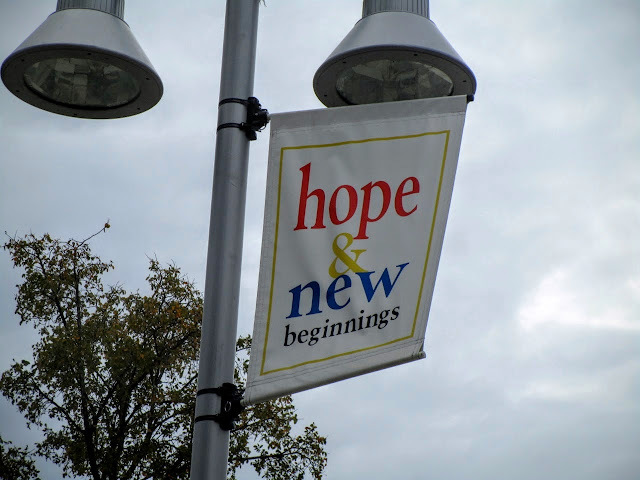 We paused to look over the planting beds she had built at the street several years ago. 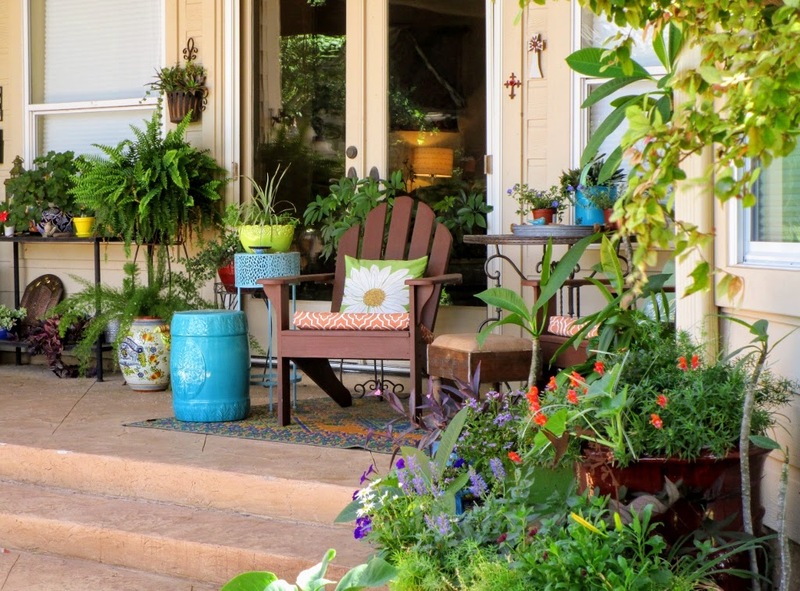 She tells the story of how her husband had always left the landscaping to her until she had these beds built and he thought they were "hideous." 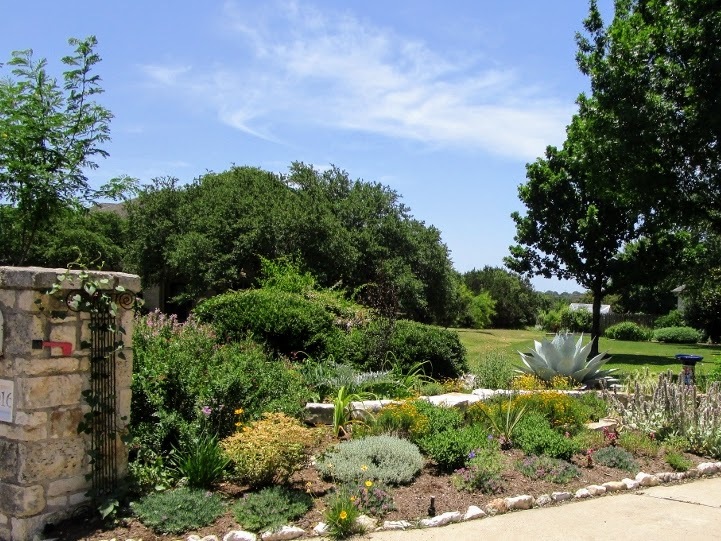 She explained that his Indiana roots give him a different idea of what landscapes should look like than we might have in Central Texas. With our eyes naturally attuned to Texas style landscapes we loved the tiered beds filled with wonderful heat tolerant adapted and native plants. We thoroughly enjoyed the morning spent touring Diana's garden and I took tons of photos. 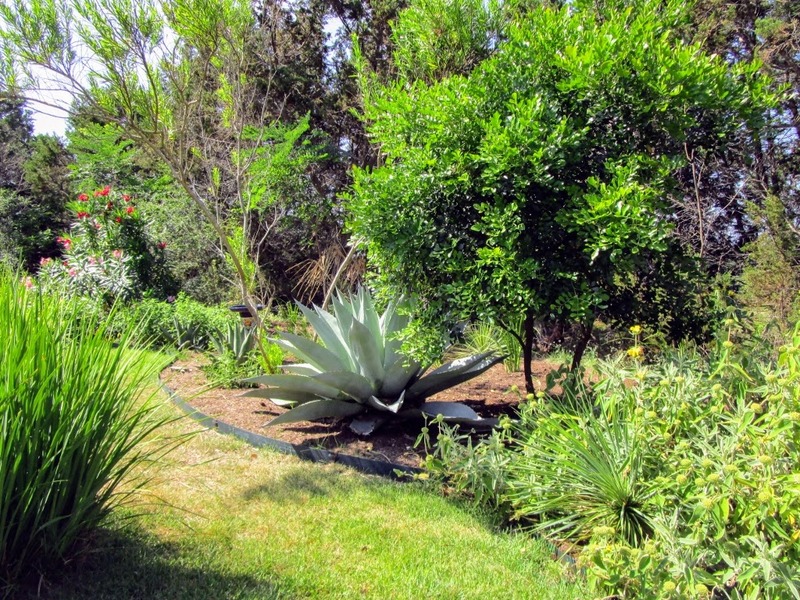 After sorting my best photos from Diana's garden I still had over a hundred in my album! Adding in rainy day photos from the Fling brought the total to 146. 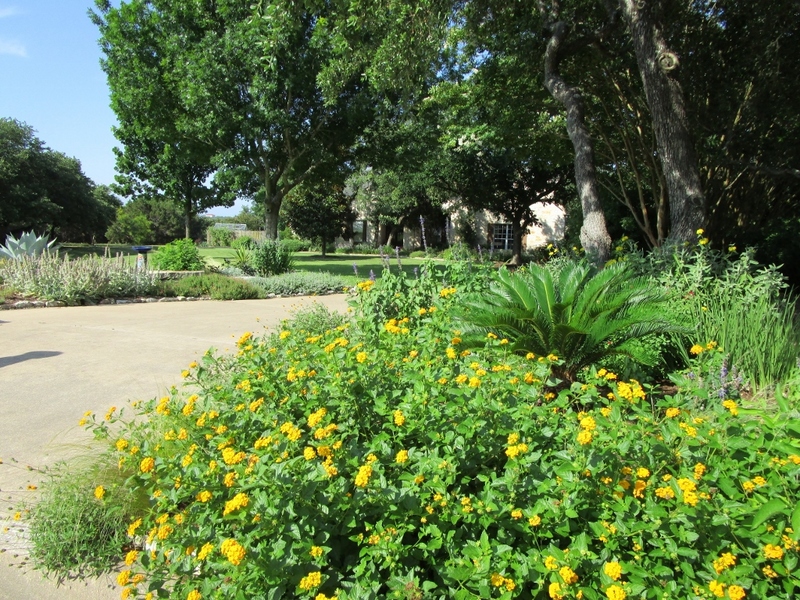 What a beautiful day to tour a wonderful garden! Thank you so much to Diana for welcoming us back for a better look. 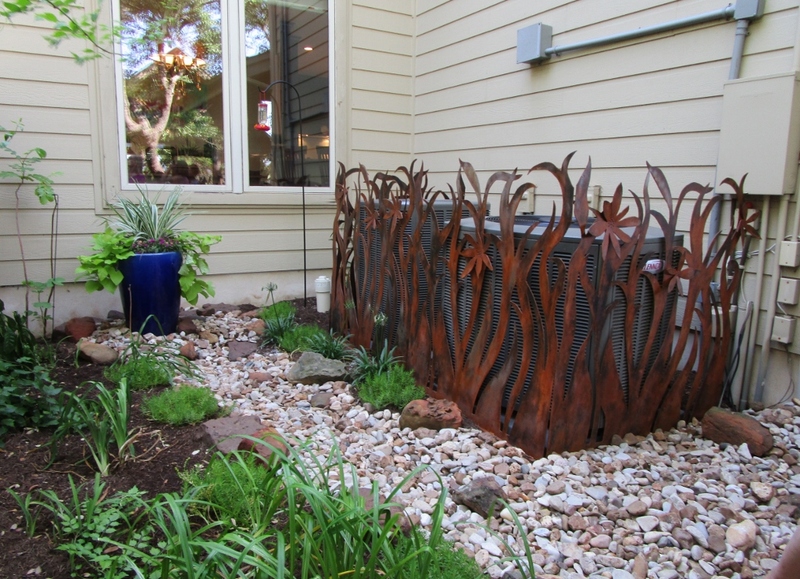 Contact Diana's Designs Austin to help make your garden this awesome. 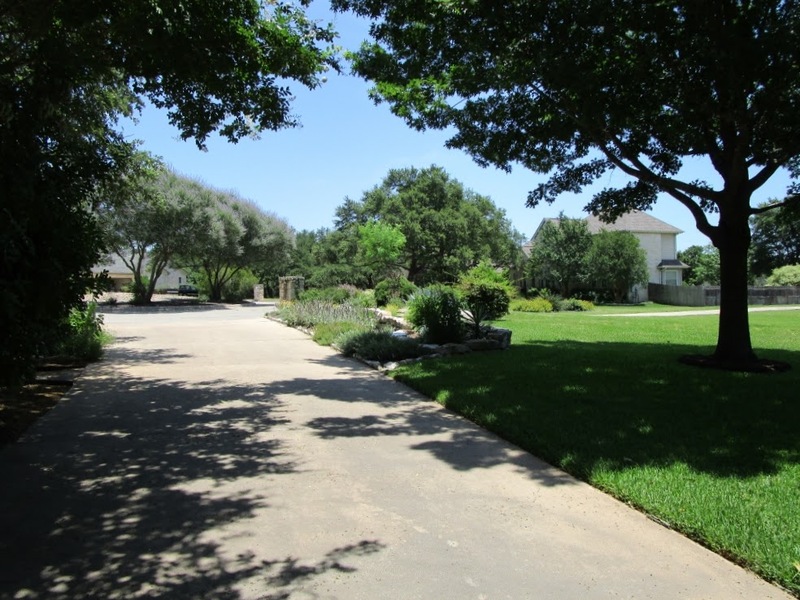 Like many neighborhoods in the San Antonio suburbs ours used to be a large ranch. Several old barbed wire fence remnants were still in place when we first moved here. A few years ago workers on a road construction project pulled out pieces of that old fencing and tossed them aside. I picked up a few lengths of barbed wire and wrapped them into rings to hang on the fence. Last week while looking for a wreath base I wired a couple of those rings together, added flag ribbon and sparkly stars to come up with a perfect door decoration for the Fourth of July holiday. It's fun to have a wreath with a connection to our home. A barbed-wire wreath around a Texas star.